As a costume volunteer for Edinburgh Museums and Galleries, I work one day a week with the museum staff on the tasks most prescient at that time. This has included conservation work on the military collections of Earl Haig, cleaning tea-sets in the Butler’s Pantry at Lauriston Castle, and helping to install the current World War One exhibition, Scars on the City. But the long-term project I have been assigned is to re-organise the 100 or so objects that make up one donation given to the museum in 1977 by an Edinburgh local, Mrs J. Lamond. Unfortunately nothing else is currently known about the mysterious Mrs Lamond, except that she clearly had excellent taste in costume! Her varied collection of ladies garments dates all the way back from the 1970s to the late 19th century, and ranges from everyday working class garments to high quality, decorative eveningwear, and even includes underwear and accessories. 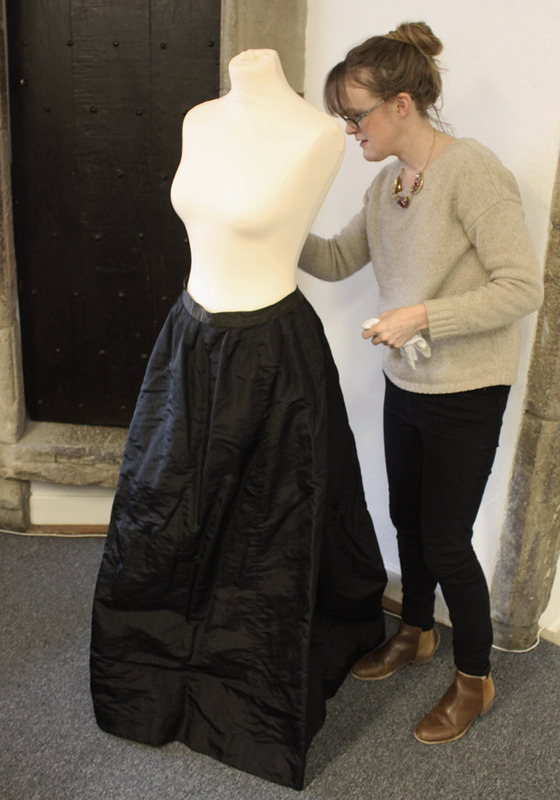 As I locate, document, photograph and re-pack each garment I will share a series of posts on my progress, offering an insight into the work that goes on behind the scenes in a local authority museum. The Lamond donation will eventually form an online exhibition for the council’s Capital Collections project. While it is not clear whether these objects belonged to Mrs Lamond and her relatives or if she herself was a collector, we hope to find out more about her and the history of the collection by searching the museum’s records, as well as investigating the garments themselves. The diversity of styles and sizes would indicate that the garments did not make up the wardrobe of just one person; some garments hang off the mannequin we are using for photography, while others will not button up. What is certain is that there are some wonderful stories behind the objects. 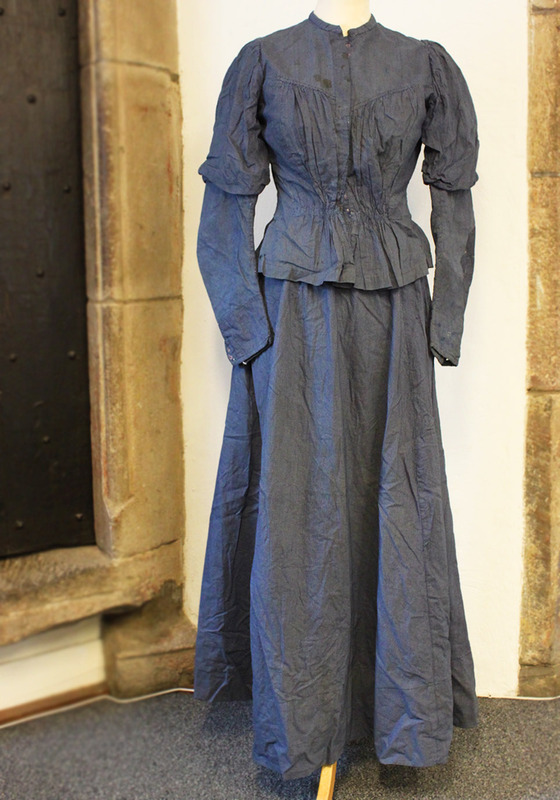 A personal favourite is a late 19th century maids costume in blue polka-dot cotton (pictured). 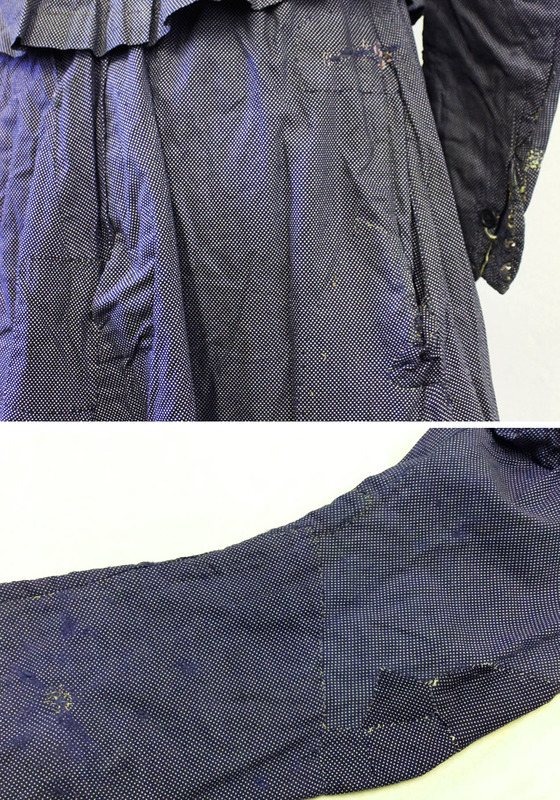 It has been beautifully repaired many times over the period of its use; it may be battered and stained, but was clearly a well-worn and loved outfit. Fashionable attire worn by the upper classes often survives in museum collections, while complete outfits of the working class are harder to come by, for the simple reason that they would have been worn – through necessity – until they no longer served their purpose, and then recycled into rags. It is therefore wonderful that object HH3851/7/77 has re-found a place in the world, and will soon be accessible online to a limitless audience. Edinburgh Museums have no dedicated costume curator or conservator – the collection falls under the jurisdiction of the highly knowledgeable History team – and costume has not featured heavily in any recent displays. 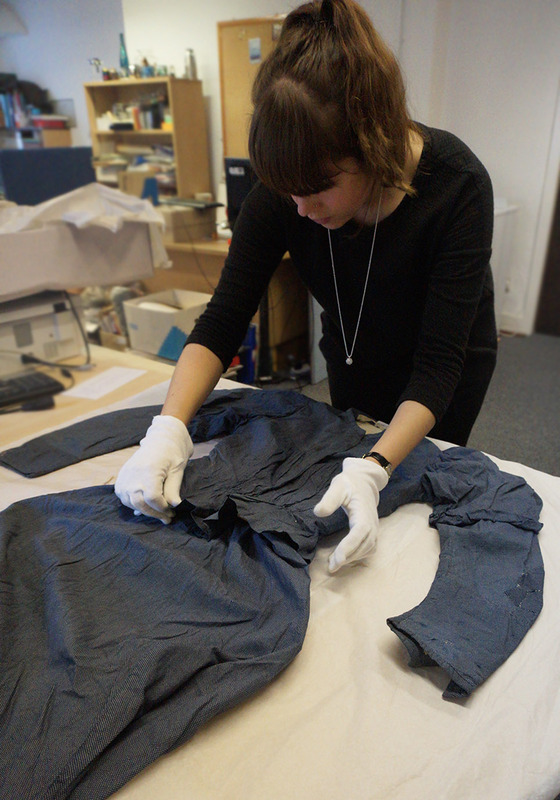 Edinburgh Museums, like so many other institutions across the UK, have suffered under the severe funding cuts to museums over the last few years (1), and it is not always possible to fund the conservation work required to exhibit fragile garments. Hopefully one day soon, possibly motivated by the growing trend for fashion exhibitions (2), some of these objects will be on display for visitors to see first hand. For the time being, projects like this are a fantastic, budget-cut-proof method for making collections accessible. With interest in dress history growing every year, unique donations like Mrs Lamond’s are a fantastic resource for students, academics and visitors alike. 1 “Cuts Timeline,” Museum Association, http://www.museumsassociation.org/campaigns/funding-cuts/19122012-cuts-timeline (accessed March 5, 2015). 2 Florence Waters, “The Clothes Shows,” Museums Journal Issue 115 No.3 (2015), p26-29.